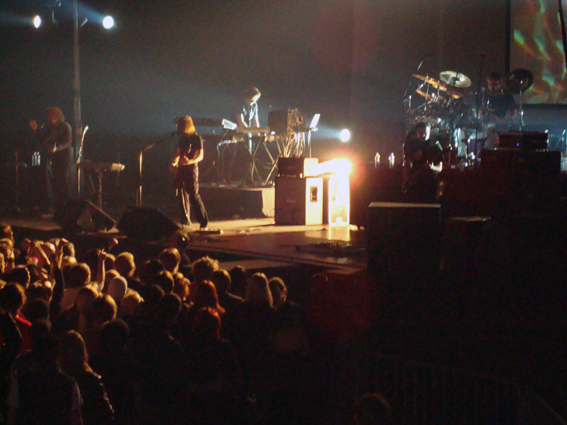 Porcupine Tree from England has gained such a big following with their two latest albums Deadwing and Fear of a Blank Planet, that a gig at a big ice hall is possible even in Finland. The venue should originally have been Kulttuuritalo (Culture House), but it was sold out very quickly so they moved the show to a much bigger Jäähalli (Ice Hall). I hadn’t been there since Metallica’s …And Justice for All tour… Also this venue was pretty full, so the band clearly has a big fan-base in Finland. And not without a reason, since the band is in really tight shape and has been able to gain also a lot of metal heads to their side along with the more traditional prog and pop audience. In Helsinki, as well as in Tampere the following day, the support act was Hidria Spacefolk, Helsinki’s masters of instrumental and progressive space/trance rock, and at least in Helsinki they did very well. The doors opened at 19:00. The lights in the hall shut down at 19:45 and Hidria Spacefolk entered the stage. Apart from the extra percussionist, all the members seem to now have short hair. At this point the band said to the audience “welcome to this prog evening”. The first track we heard was the familiar “Symetria” that goes in ¾ rhythm and brings to mind Kingston Wall. The other guitar player Sami was at first a bit too loud and there was some feedback. The track got heavier towards the end. I somehow felt, that the band played with a bit heavier touch than usual, or was it just the louder volume? During the second track “Radien”, also from their latest album, the sound got better and the main floor begun to fill up. The track included some nice repetitive grooves and at times they got heavier again. At this point there was plenty of time for a beer. More people were showing up and when the intro started at 21:07, the hall was almost full of enthusiastically shouting fans. They had hung up a big screen behind the band for the excellent videos mostly to do with the themes of the new album. 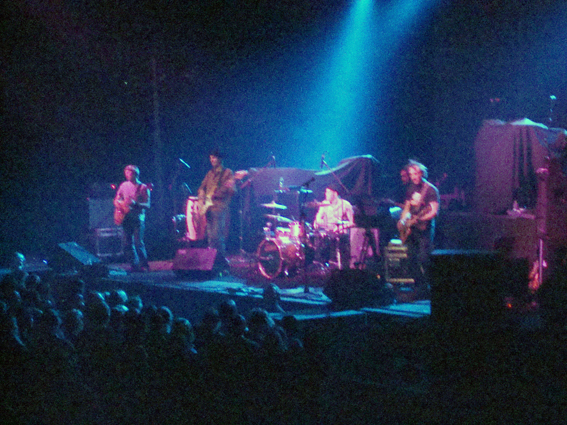 The gig started off in a familiar manner with the new album’s opener “Fear of a Blank Planet” that surely worked very well right in the beginning. Amazing! In the beginning of the little more peaceful “What Happened Here?” that can also be found on the new album Steven sung without his guitar and some exiting patterns were projected at the background. Then they returned to a bit older material when we heard the track “Sound of Muzak” from the album In Absentia. There were a lot of cigarette lighters out there during the single track “Lazarus” and some old home flicks were shown on the screen. The applause after the song was deafening! At this point of the night it was time for the new album’s long main piece “Anesthetize”. There was some sped-up video images running at the background and Steven Wilson played some keyboards in the middle. 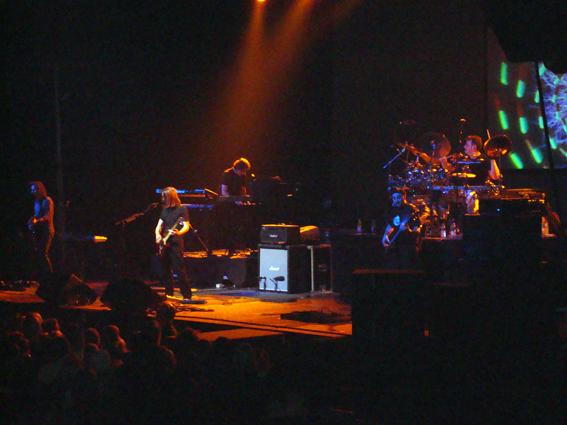 During the more laid-back, Pink Floyd styled part they showed some slowed-down images of gigantic waves which was very suitable for the atmosphere. “Open Car” got the audience to raise their fists in the air with its jerky metal and beautiful chorus. Then they played an over ten years old “Dark Matter” that started with a great, mystical and ambient synth thing. It was very nice to hear some older material as well, but when will they play something from the first three albums? We didn’t get even “Radioactive Toy”… During the rough “Blackest Eyes” the audience went just nuts. Heavy stuff! “Hate Song” from Lightbulb Sun followed next and Colin Edwin started the track in a superb way with his bass. Wes didn’t play at all on this one but did some backing vocals at times. Steven freaked out some pretty psychedelic stuff on his guitar and during the more jamming ending also the drummer Gavin Harrison got to show off his abilities. The highly beautiful and sad ”A Smart Kid” came next and there was some programmed rhythm in the middle. “Way Out of Here” from the new album was one of the most magical moments during the show. “Sleep Together” from the same album ended the main set with its funny robot video and other psychedelic images. In the end Steven was playing keyboards again. Porcupine Tree let the audience cheer their lungs out before they returned to the stage to play the old single track ”Waiting Phase 1”. Wes played acoustic guitar and it was really nice to hear this amazing song! “Trains” was a natural choice after that, and the audience was very excited. Another superb track. For the last track the band still gave us “Halo” from their latest album and I must say that it was a very strong performance. Some of the lyrics of the track were projected to the back to a great effect. A marvelous ending for an amazing gig! The sound was excellent and these fellows sure are top-notch musicians. The voice of Steven Wilson is unbelievably emotional and beautiful and I’ll never get tired of listening to him. This surely was one of the best gig I’ve seen this year, or ever for that matter. The band promised to be back soon, and I for one will be there again!